On Saturday 1st November, a Royal British Legion charity concert was held in St Barnabus Church Ealing. The event, which was sponsored by Lodge Brothers and other local businesses, featured the band of the RAF The Squadronaires, who played well, as they always do! People were jiving in the aisles, and everyone had a great time. Judy from Lodge Brothers Northolt Branch served supper for the band and provided light refreshments for all attending. 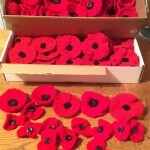 Judy also boosted the fund raising by selling the poppies that she had crocheted, which added another £100. Poppies given to The British Legion in Greenford raised £200. The final total of monies raised is yet to be confirmed but looks to be over £6000 with all this going to Help For Heroes and Veterans Aid.